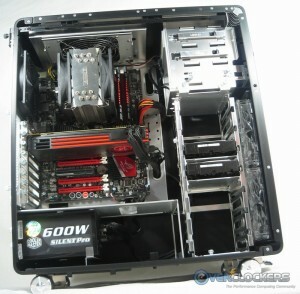 The last Lian Li case we reviewed, the PC-X900, was a sight to behold. 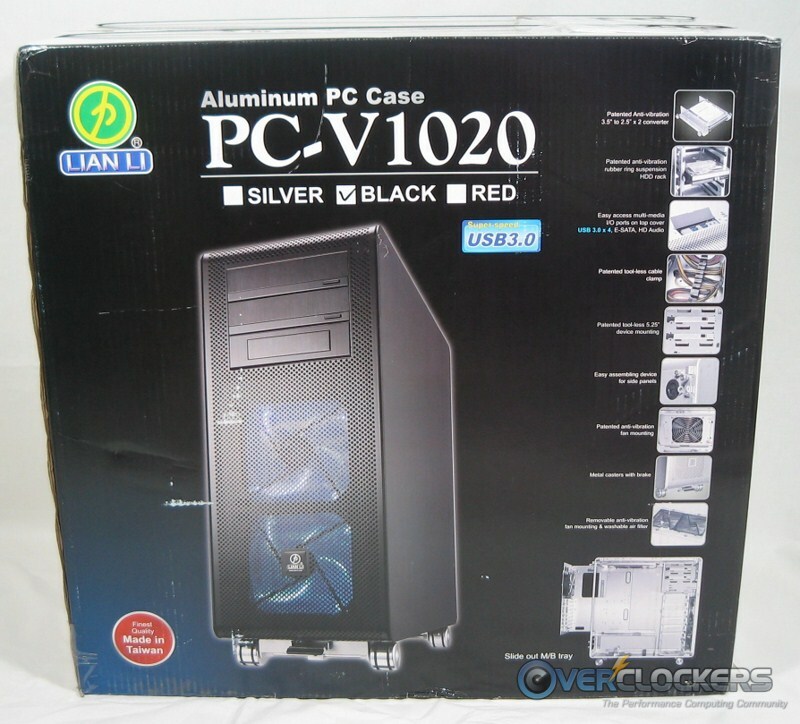 Today we’ll look at another of their offerings, the PC-V1020. 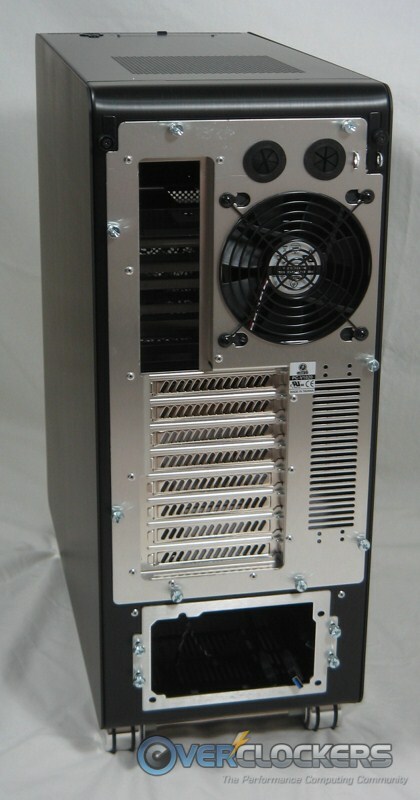 It’s not a water-cooling oriented case as the PC-X900 was, but will it do well for air-cooled machines? Let’s find out! 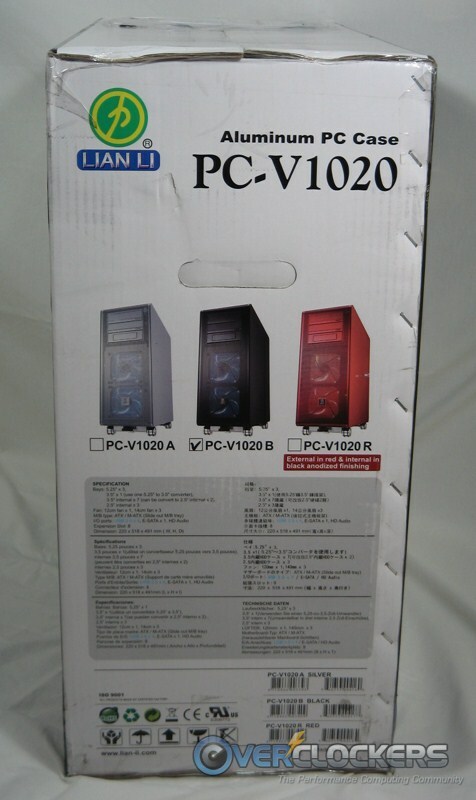 Like most quality cases (and certainly like all of Lian Li’s cases), the PC-V1020 comes shrouded in protective plastic and shielded from bumps and bruises by a solid layer of foam floating it in its box. It survived the trip without issue. 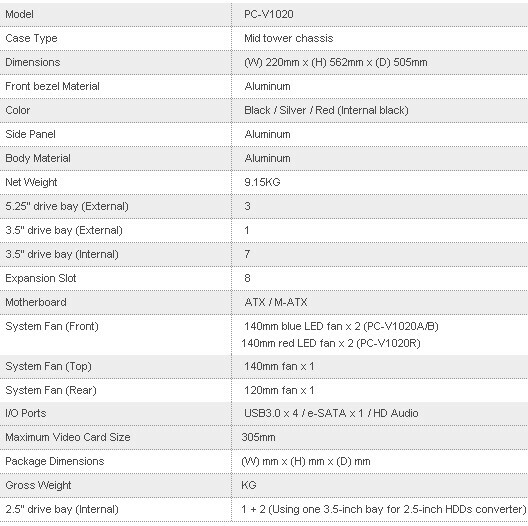 Yep, I’m going to be that guy and make you wait to see it until you read the specifications again. Bet you thought I was going to show it to you early this time, didn’t you? 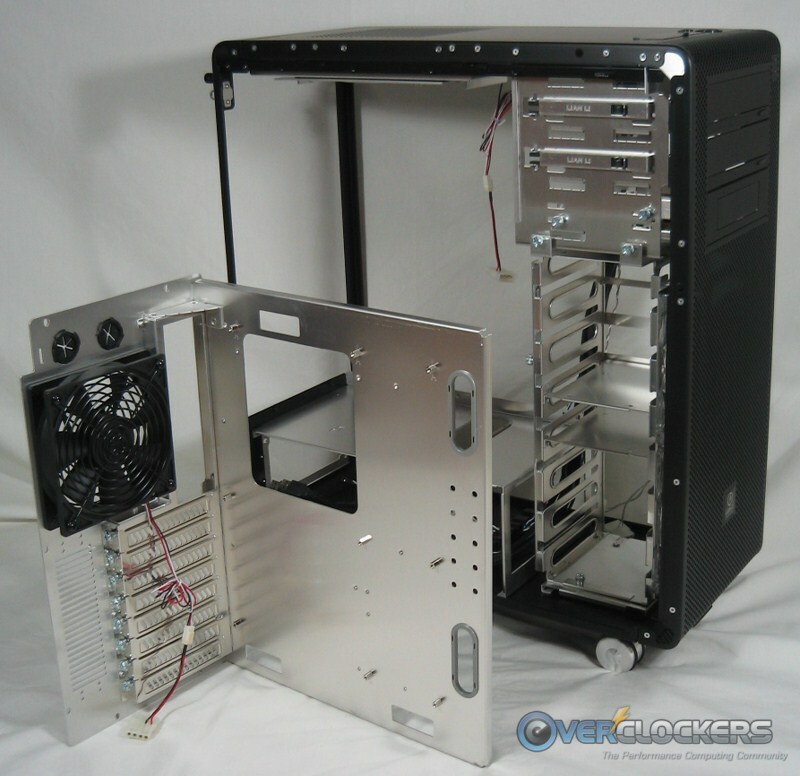 Did you learn nothing from the PC-X900 review? It’s definitely a solid case all around. With three 140 mm and one 120 mm fans, it should keep the air moving well enough to cool pretty much any system. 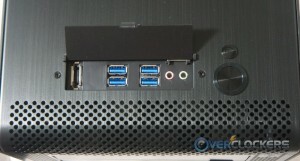 USB 3.0, seven HDD bays and 305 mm max video card size are also features for a case aimed at computing enthusiasts. After unwrapping the PC-V1020, we see a shining example of understated beauty. It’s not all dolled up with external bells and whistles, but looks very nice in spite of its attempt at understatement. Subdued but elegant is a great way to describe this case. 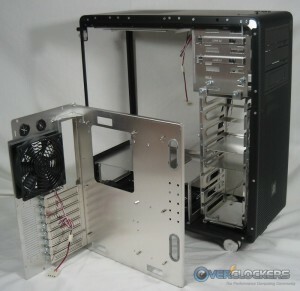 It’s not going to be the talk of a LAN party modding circle, but it will still look good holding your system. The top I/O panel is identical to the PC-X900, with an eSATA port, four USB 3.0 ports and front-panel microphone and headphone jacks. 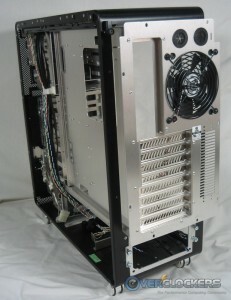 To the right of the I/O panel you can see the power and reset switches. 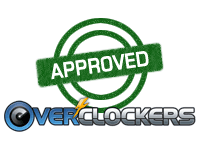 After using it for a little while, including a few overclocking sessions, I really wish the reset switch was larger. My fingers are by no means fat, but I find it somewhat difficult to press that teeny tiny button when it is needed. 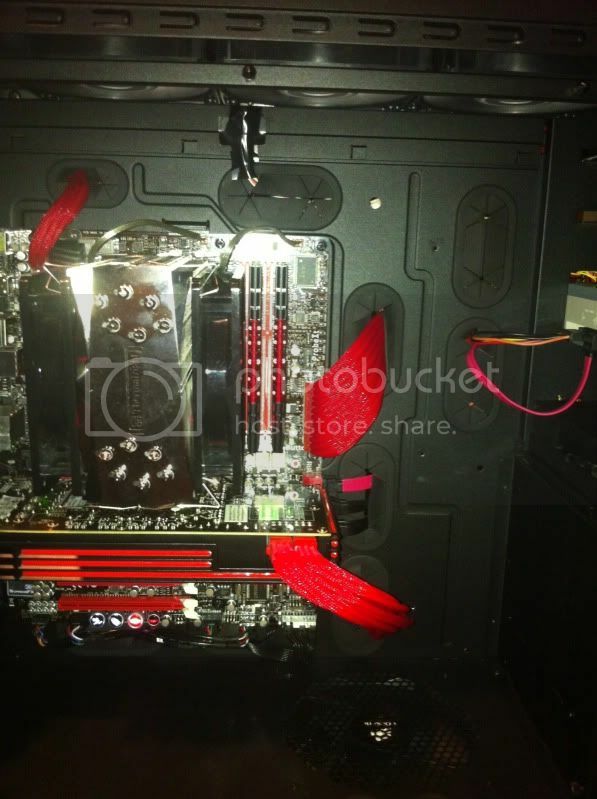 A great touch is the PSU dust filter. 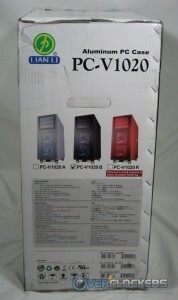 We also saw this on the PC-X900. Few things kill components faster than heat, and dust build-up can increase that heat exponentially. 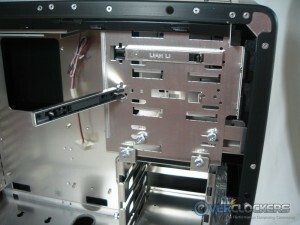 Lian Li does a great job of filtering incoming air and does it with easily removable filters, which is all the better. 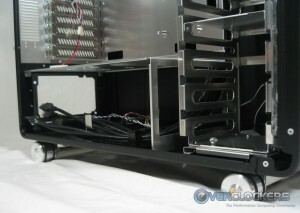 The wheels are (well, seem to be: I didn’t ask) aluminum just like the rest of the case. They are very solid and easily roll even on carpet. 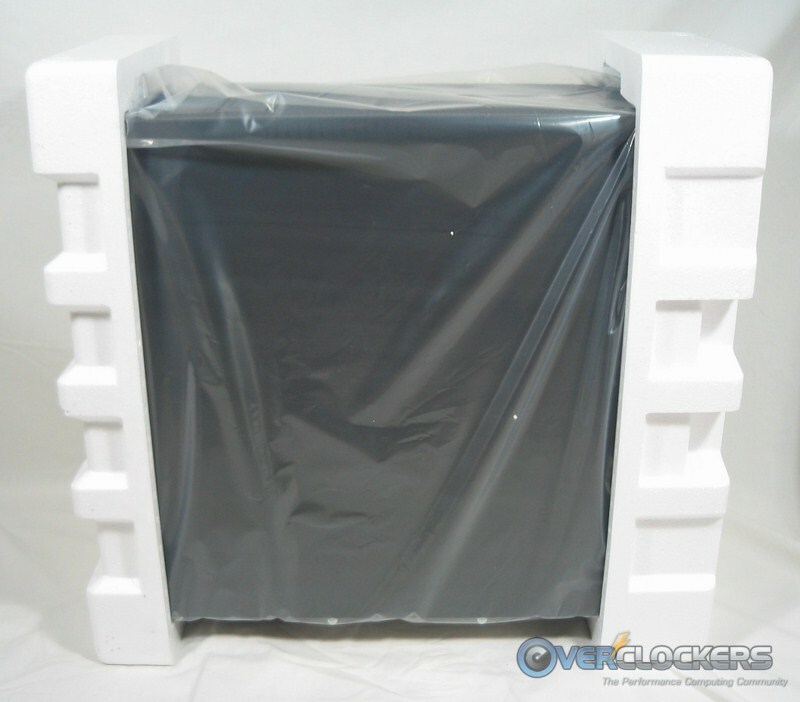 They have rubber on them to keep them from sliding on and damaging wood floors. 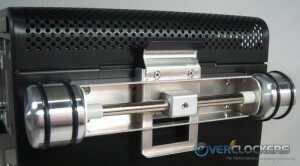 The locking mechanism is simple, but really smart as displayed in the photos above. There are plenty of various bits and baubles to get your system installed. 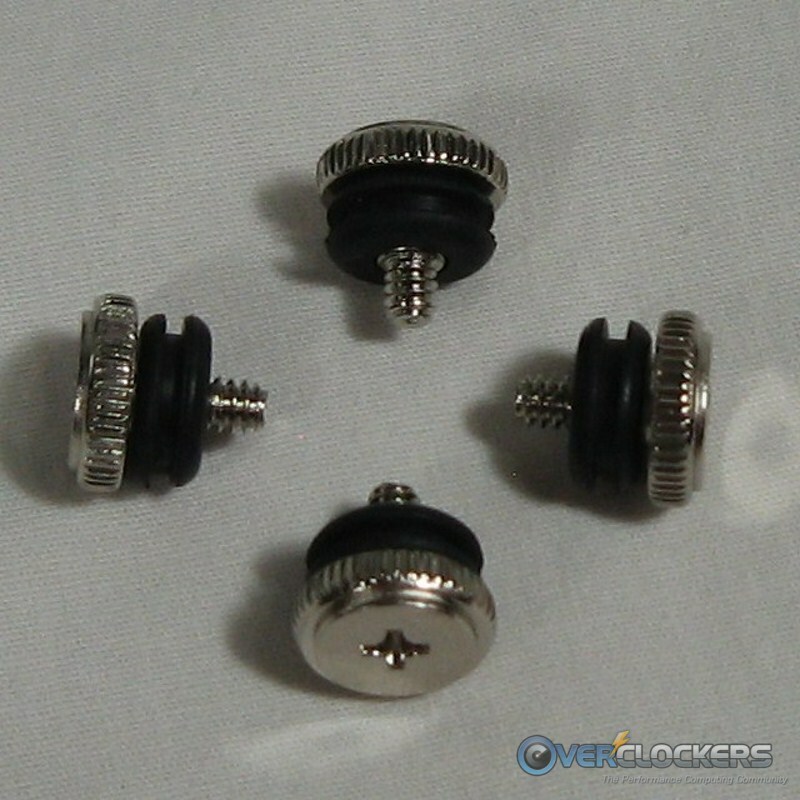 Thumb screws for installing the MB are convenient, as are the easy-to-use rubber grommets and screws for HDD mounting. They even include a handy case to put it all in rather than having to keep track of all those bags (with holes in them, leaking screws all the time). 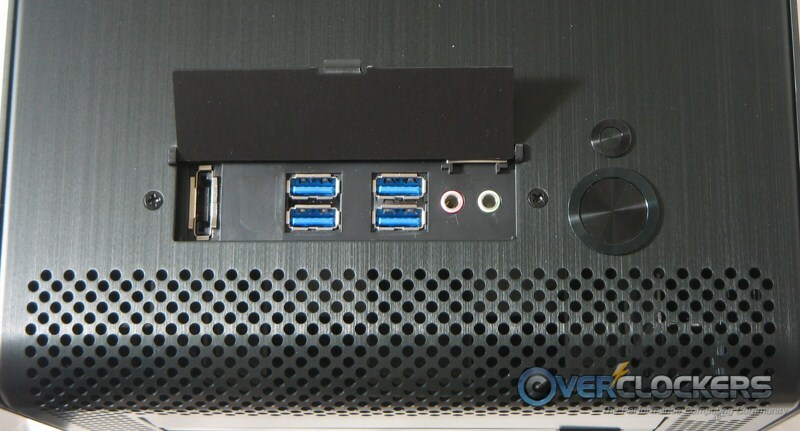 Conveniently, you can see they’ve included a USB 2.0 -to- USB 3.0 adapter cable so you can use your MB header to power two of the front USB ports. 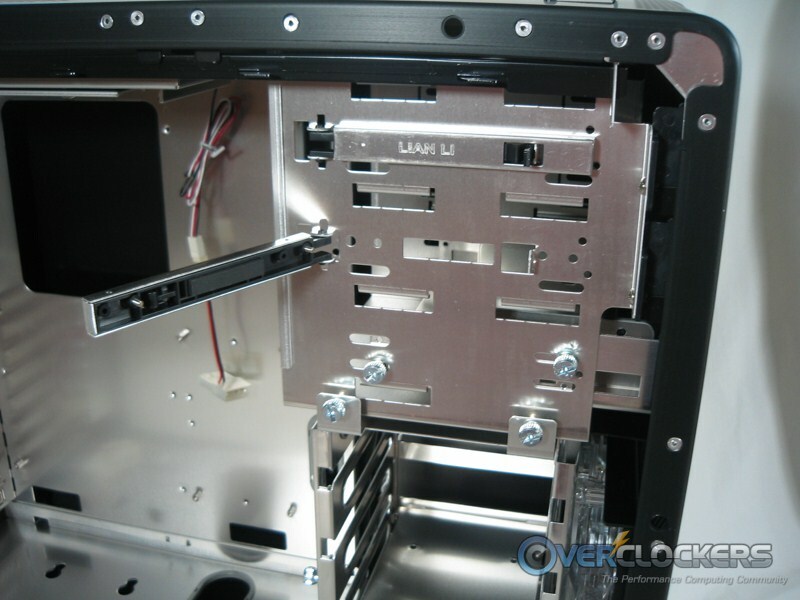 Unlike the PC-X900, they have included a dual-2.5″ SSD bracket (the two aluminum pieces), which is a nice addition considering anyone looking at a higher-end Lian Li case almost certainly has an SSD to use. 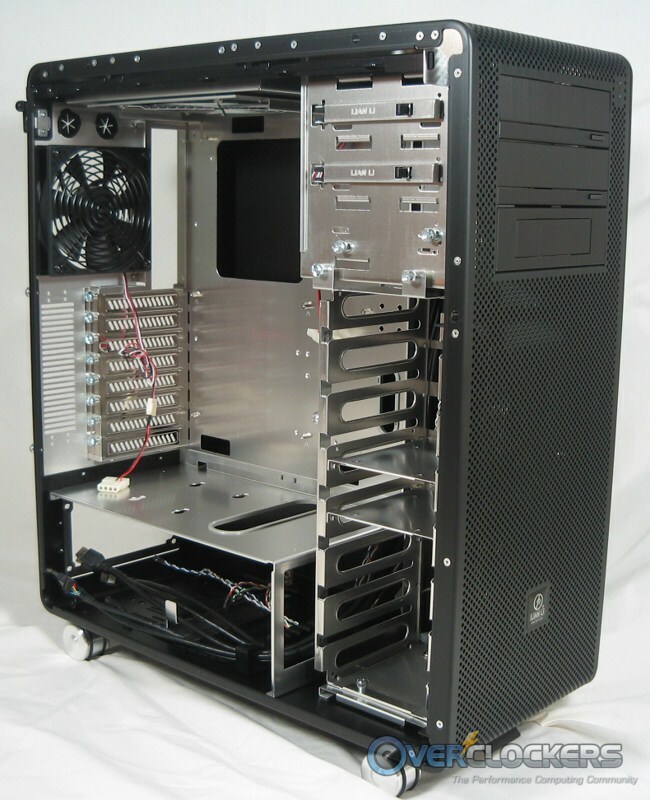 Moving to the inside, we have an impressively roomy case with an unreal amount of HDD bracket goodness. 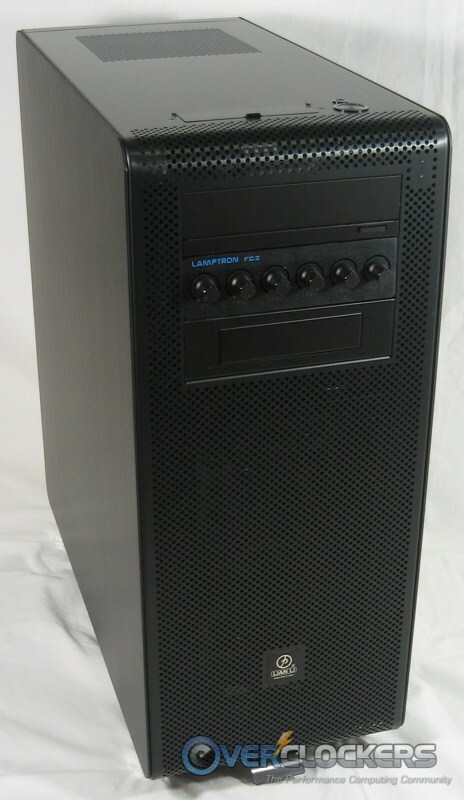 This thing could feasibly serve as a small server if someone wanted a really good looking server box. 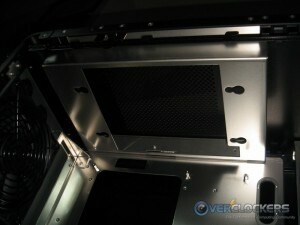 I like that the interior is shiny aluminum. 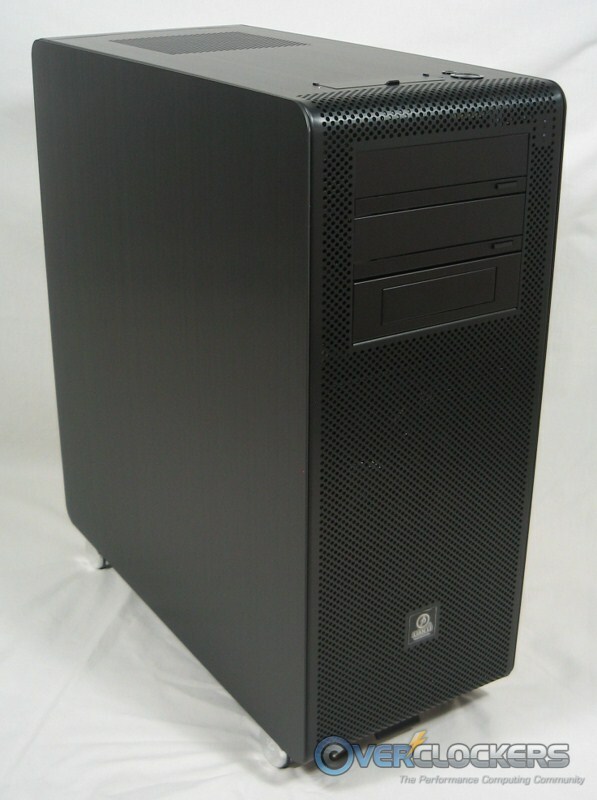 It contrasts well with the black used elsewhere. 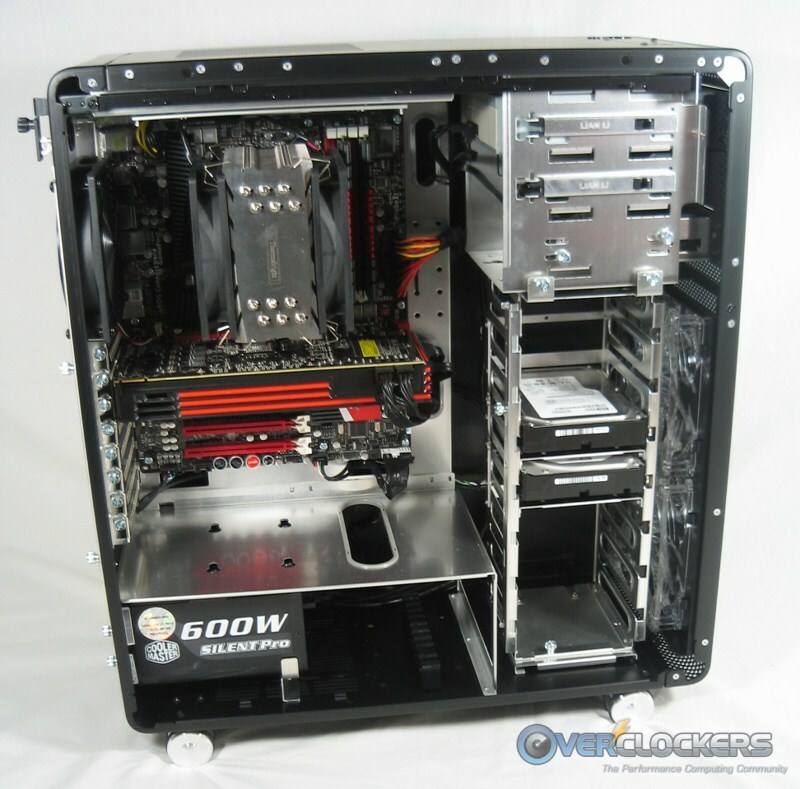 The biggest drawback is that this case doesn’t have a window – this is one interior that deserves to be shown off. Even more so because those four holes in the panel over the PSU compartment are made such that you can put screws on the bottom of an SSD and install it front-and-center to show off your drive. After removing eight thumbscrews (which may require a screwdriver the first time you do it; they’re pretty tight), the tray slides right out. When reinstalled it’s obvious the tight tolerances Lian Li has when building their cases. There is no wiggling, play, or vibration. 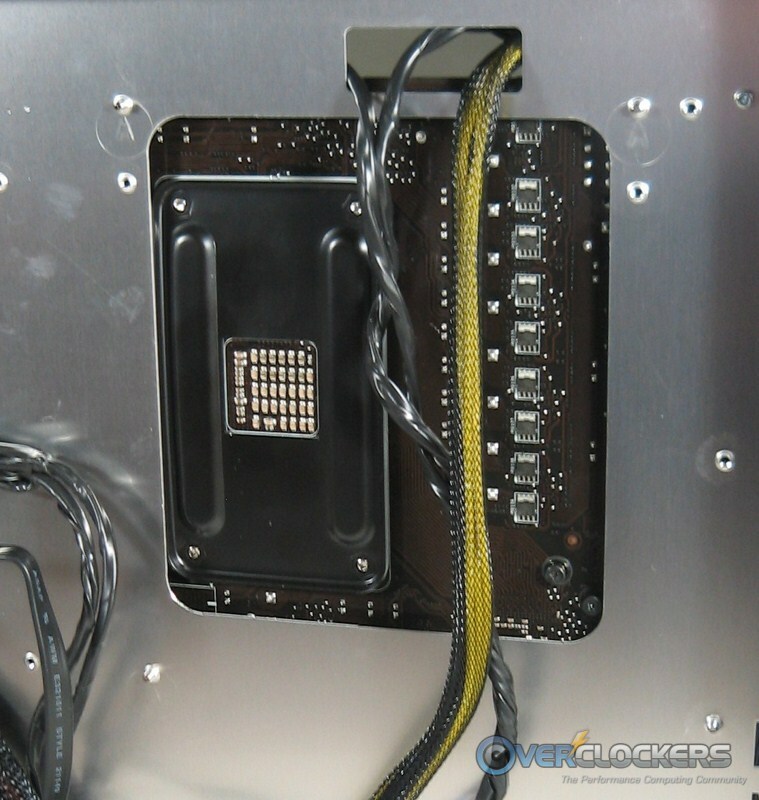 Removable motherboard trays are okay I suppose, but to be honest I never really understood their usefulness after the first installation. After your PSU is installed and the wires are managed, chances are you’ll have something wire-tied to it, which makes it a pain to remove. Although for the first installation it does come in handy. 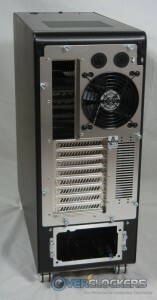 As with the PC-900X, the PSU is mounted on a removable bracket that you fit outside and then slide in. 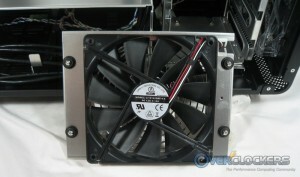 The holder that props up the front of the unit is movable to accommodate different sizes of PSU. 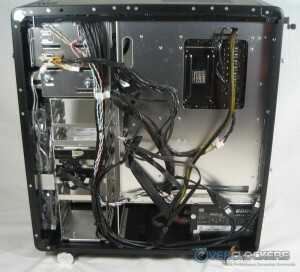 There is also a convenient cable management bracket directly in front of the PSU. The ODD bays are mostly tool-less, with brackets that snap into place. There may be tools needed occasionally though. If you want to install a fan controller (or anything that doesn’t use the fold-down ODD brackets), you have to use a screwdriver to remove those. Sometimes it is also a good idea to stiffen the install by using a screw on the back side. So, tool-less? Possibly, but it’s generally better to have a screwdriver handy. The hard drive system in this case is quite well thought out. 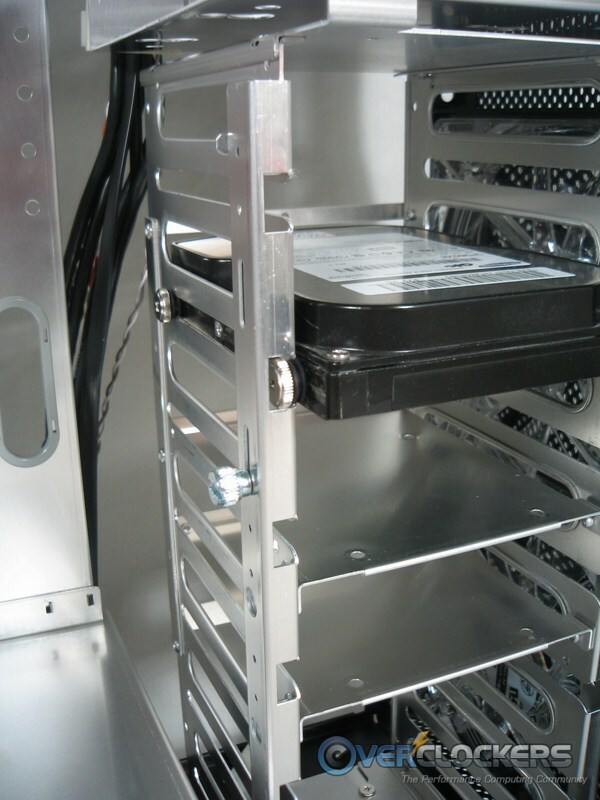 There are spaces to install seven drives and they’re cooled with two 140 mm fans right next to them. The cage is also completely removable, which you have to do to clean the fan filters on the front intake fans. 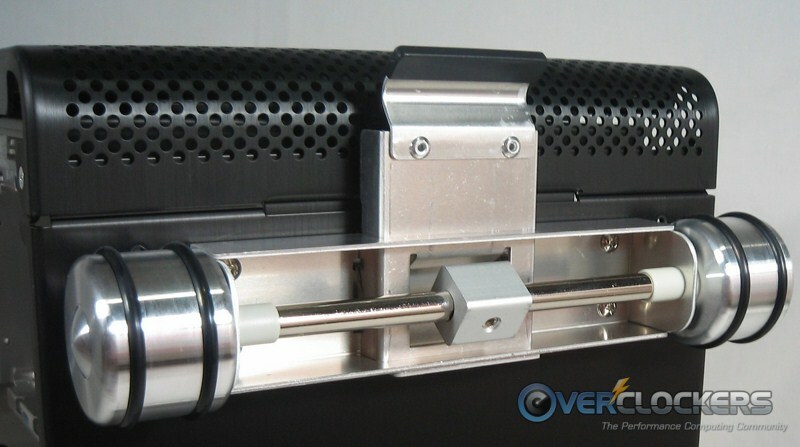 You can leave all but the very bottom drive installed when you do this; removing the rest isn’t necessary to access the thumb screws that allow you to pull the rack. Just remember this will be necessary down the road to clean your filters, so don’t wire-tie anything to the rack itself. This brings us to the HDD installation. This was a neat feature to discover. 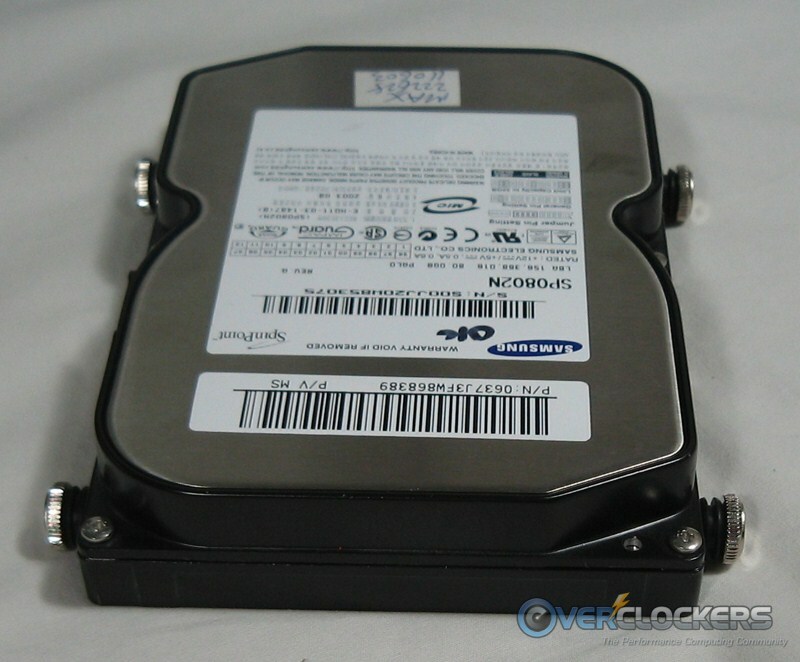 First, you install rubber grommets on the HDD screws, then put them on the HDD. 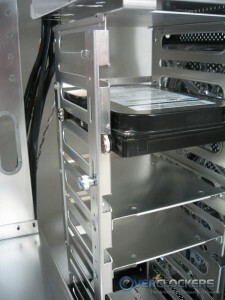 After that, you slide the HDD back in its track, then lift up the thumb-screw/slide on the HDD rack and tighten the screw. 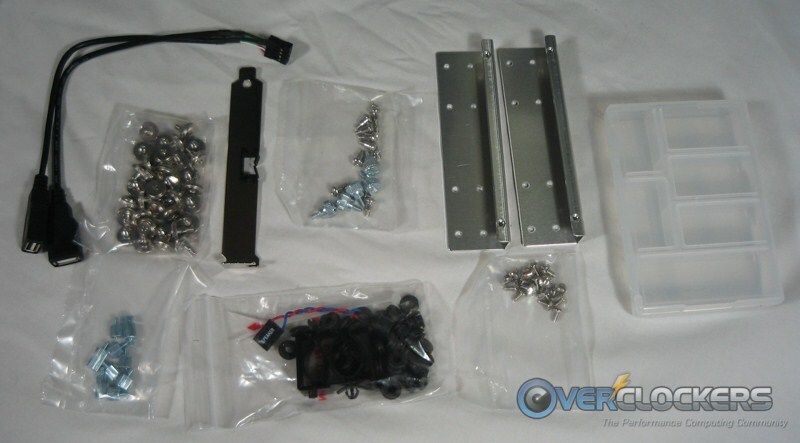 This is convenient because you don’t have to mess with individual HDD brackets (bending these round a HDD can be a pain), plus it gives you easy access to install or remove all HDDs at once. This method also stays away from the plastic used in so many cases. It will last a lot longer than plastic too. 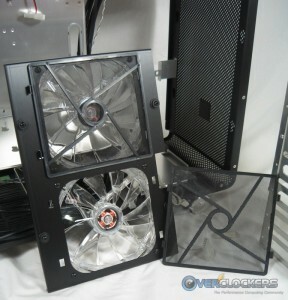 Last, but not least, we’ll check out the top exhaust fan. It too is removable. All you have to do is slide it forward and pull down. 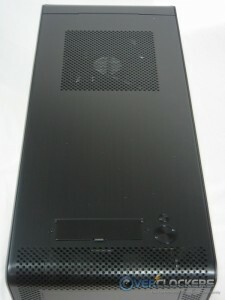 The screws on the fan bracket have rubber grommets on them to minimize vibration transfer to the case itself and it’s an easy way to replace the fan or clean the area above it. 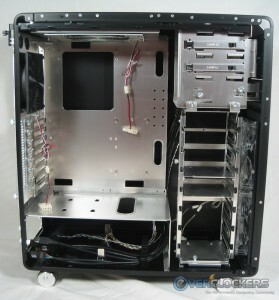 Now that you’ve seen the case inside and out, let’s see how all these features come together in practice. 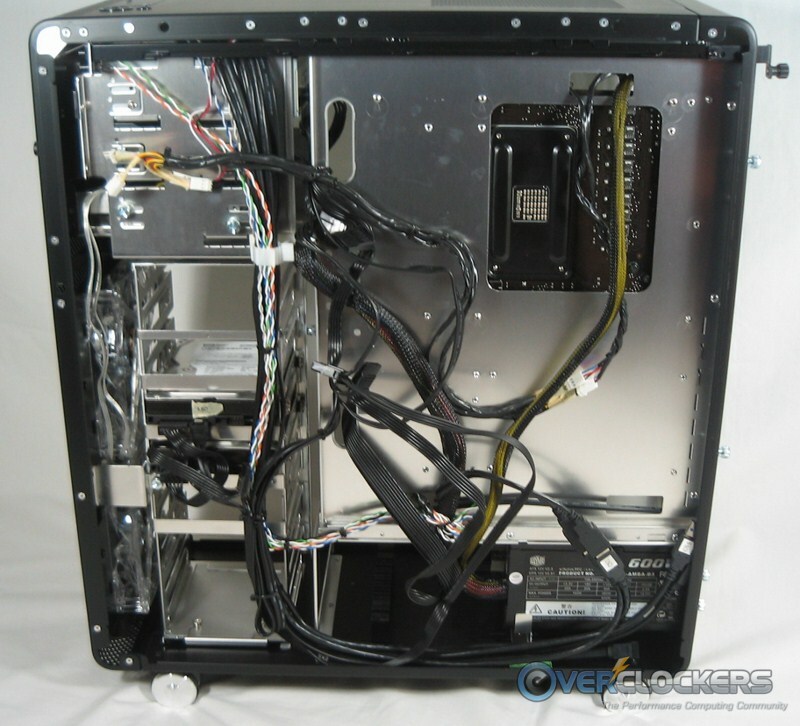 First, the rat’s nest of wires. 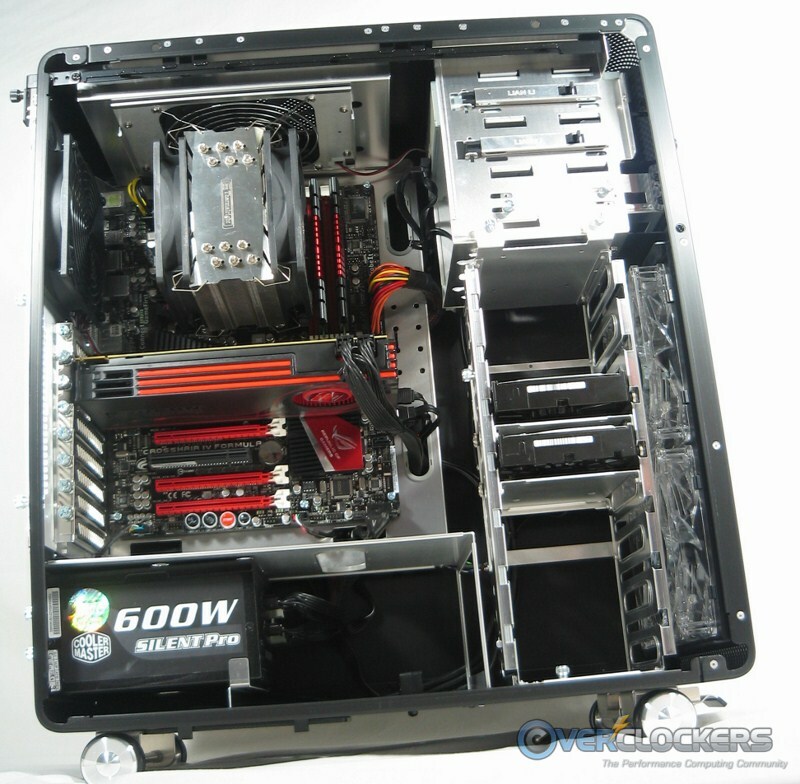 As you can see, you can throw wires pretty much anywhere with all this room. 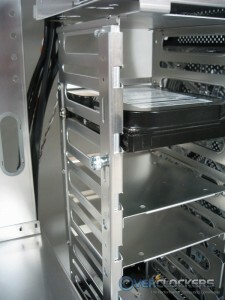 I’ve also come to the conclusion that very few cases have enough room for cooler bracket installation. 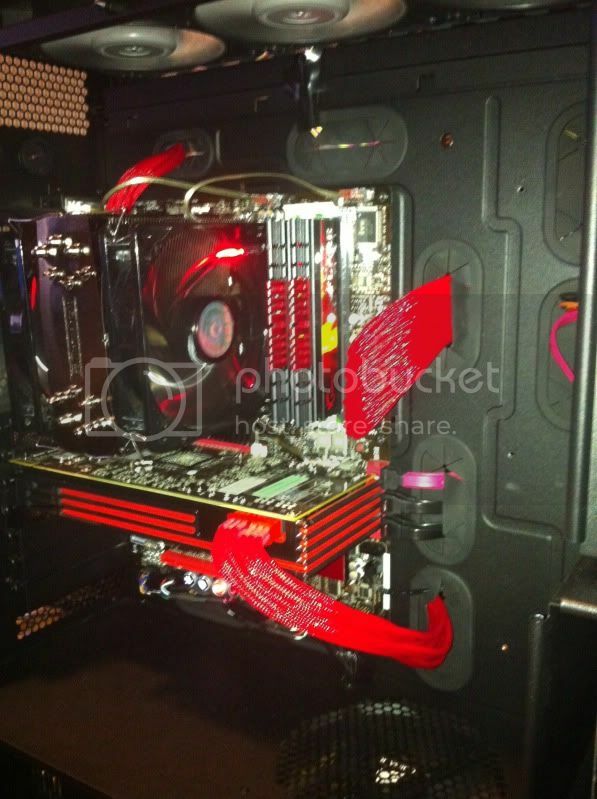 This one was oh so close, but not quite close enough for mounting the cooler bracket without angling it in there. 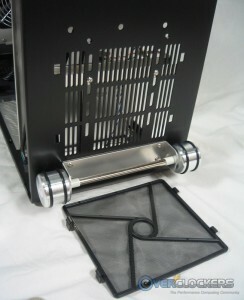 It did go in without removal of the MB tray, which was the goal; but just a smidgen larger would be better. 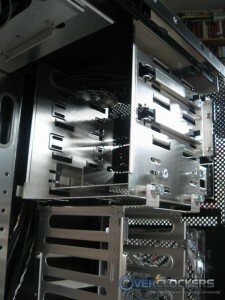 The back of the system looks good with everything installed. 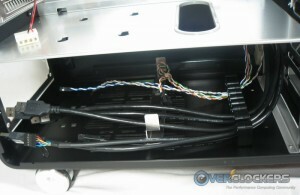 You can see the PSU bracket on the bottom and how it operates – four thumb screws after mounting to your PSU with regular screws. 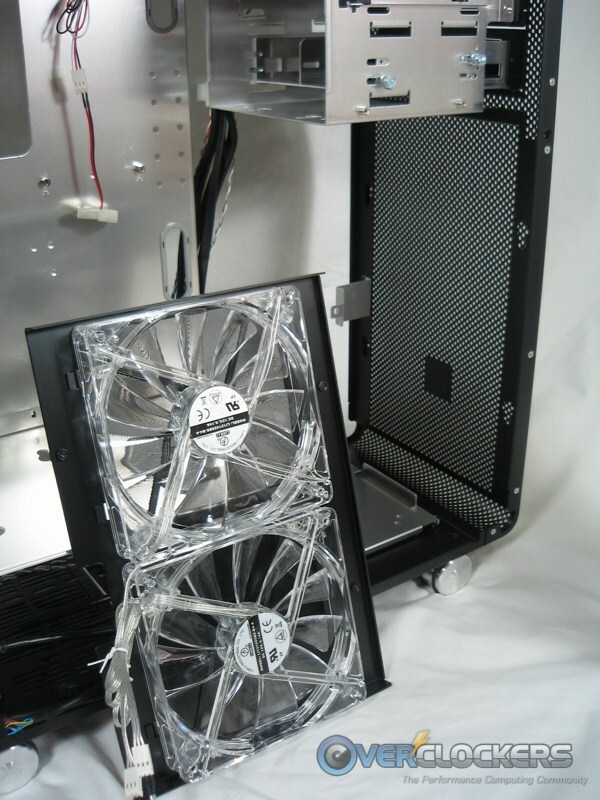 Another nice touch is the rear exhaust fan mounting. 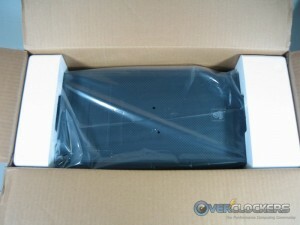 It is mounted through rubber grommets to isolate its vibration from the case as well. 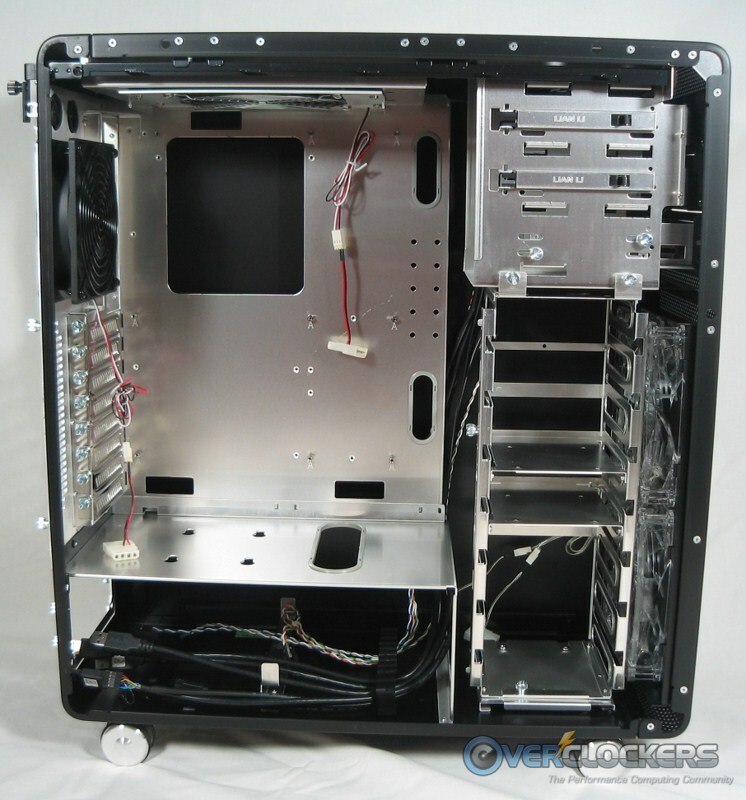 There are two water tubing holes, but they are more of an after-thought with this case. 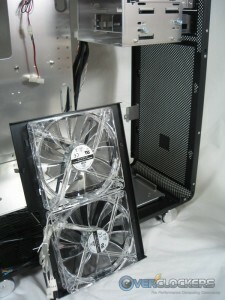 Without the facility to mount an internal radiator, air cooled systems seem to be the focus of this model. 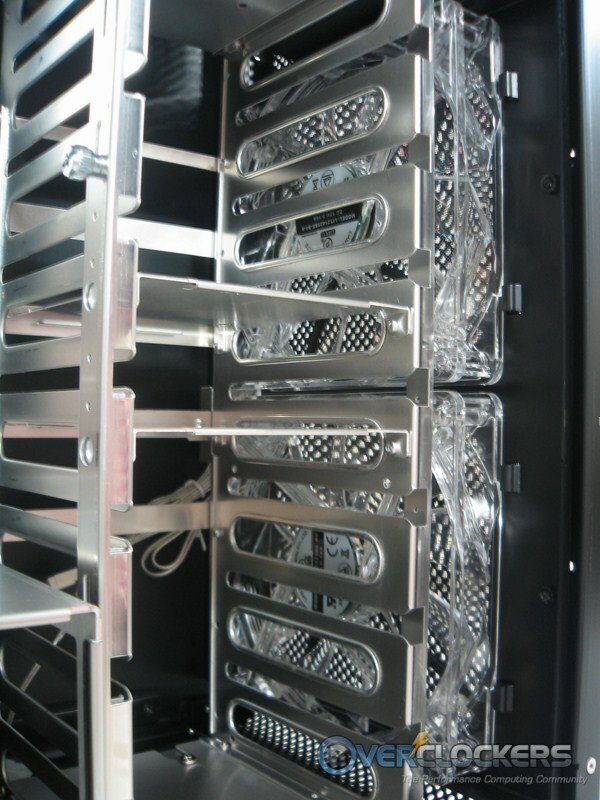 Enough stalling already…here’s what a fully installed system looks like. This looks not bad at all, and would definitely be worthy of showing off if there were a window. 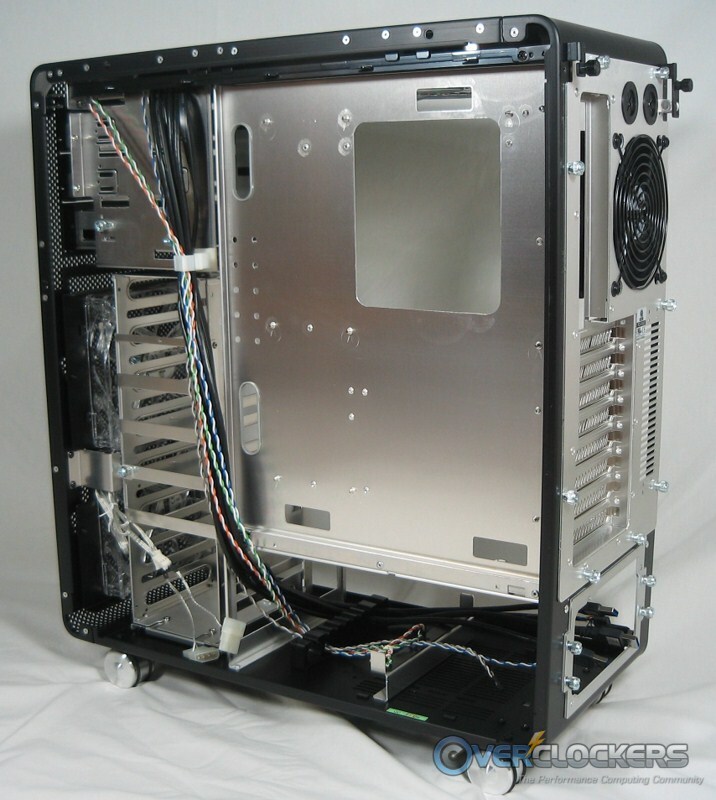 Users that buy this case will either have to cut their own window or just be statisfied knowing that their system looks darn good under the hood. All closed up, we’re back to elegant and understated. Even without a window, it’s a very sharp looking case. 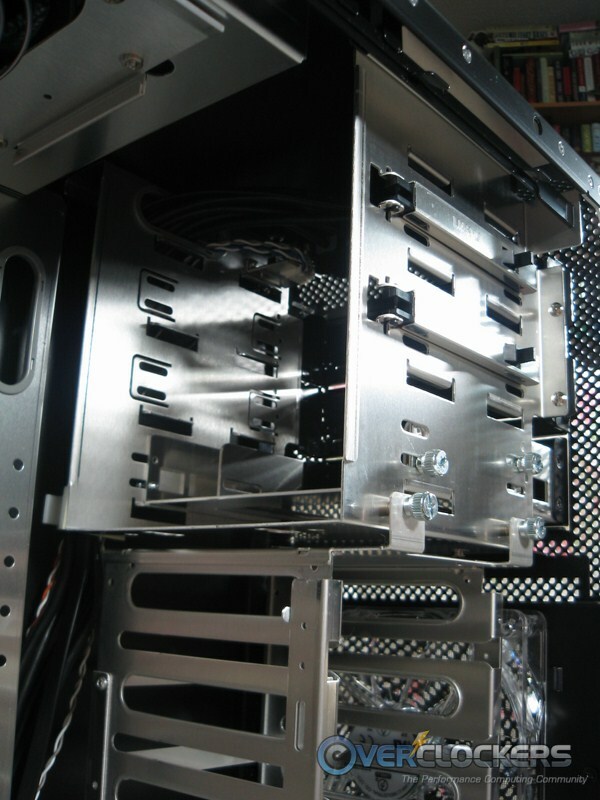 This case is a beautiful example of what superb construction, a little flair and smart engineering can accomplish. Functionally it’s a dream. It’s completely tool-free (except for the optical drive covers), and quite easy to use. 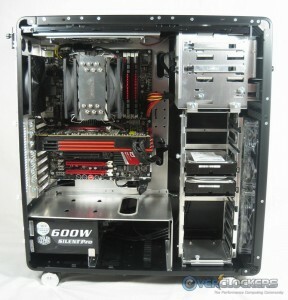 In the looks department, the only thing that would make it better is to add a side panel window. 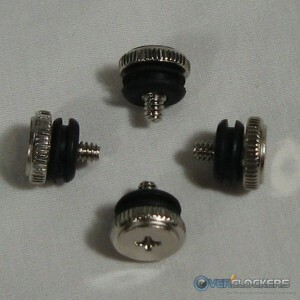 There isn’t one on their web site, but it would be a nice accessory addition if they chose to make them. 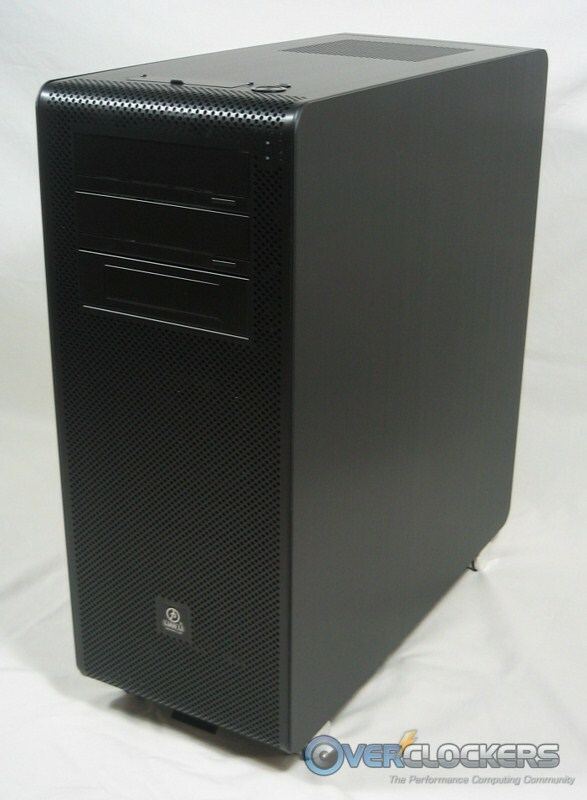 Even without it though, this is a quiet, strong and good looking case that will last you for years. 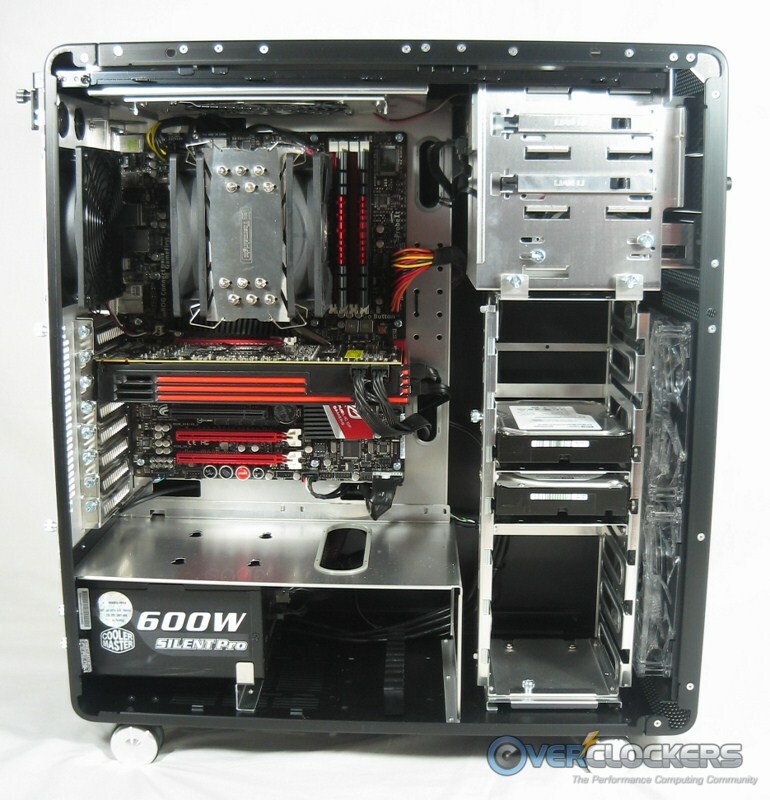 It currently goes for $249.99 at Newegg ($259.99 for the red version), which makes not having a side window that much easier to swallow. 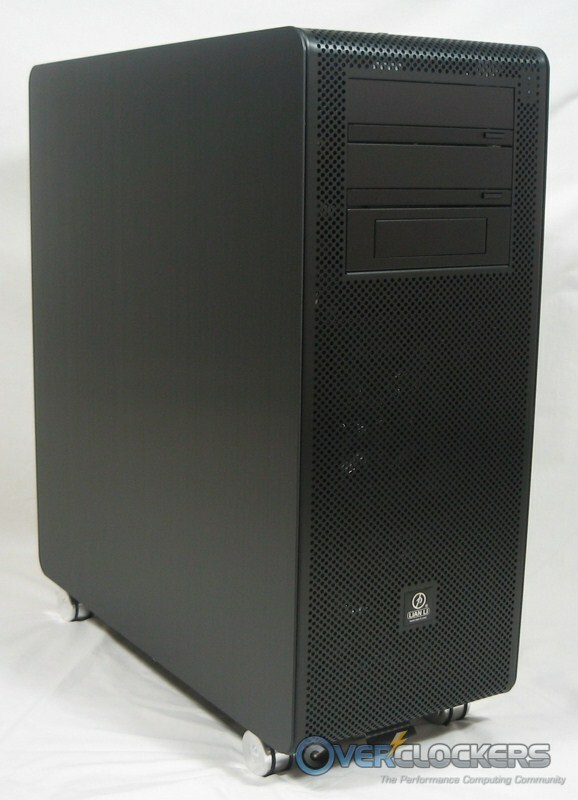 It’s not a cheap case, but it’s not made like one either. If you want a great case that’s going to last you through many-a-system, this is definitely one to add to your wish list. Looks like a nice piece of kit - but I can see what you mean about it lacking a side window. and.... seriously! 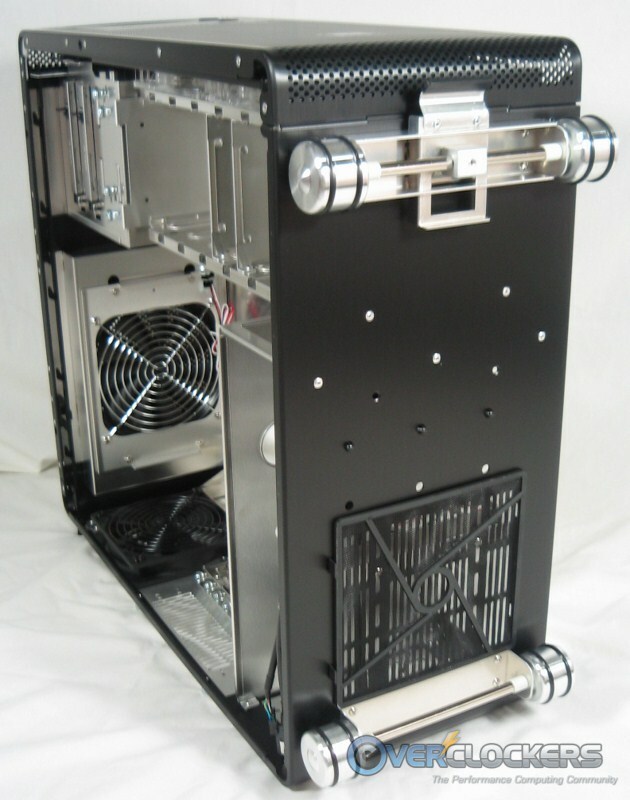 This case is gorgeous inside. 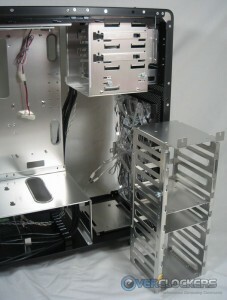 The contrasting shiny aluminum would be great to show off. Everything else is amazing, though! Those extensions definitely look nice though. 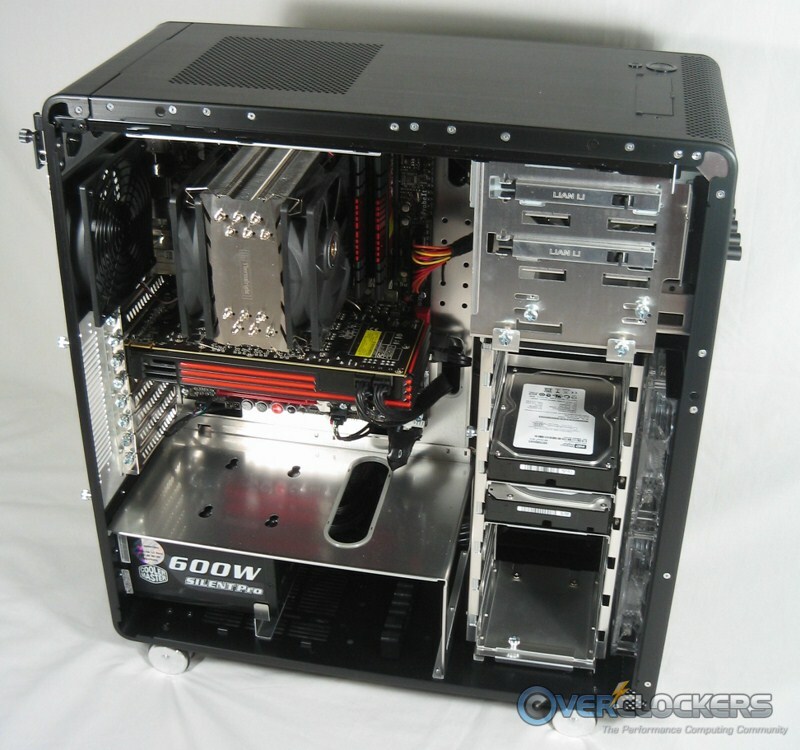 I forget just how massive the 800D is until I see air cooled versions. It's just HUGE. Nice build.